When the Levy Breaks – Is Dedicating an Infant, Covenant Breaking? I am very worried about a Welsh Presbyterian goat farmer. Apparently Paul Levy, the International Presbyterian Church (IPC) in Ealing, keeps goats on a farm. And he is concerned about them. Paul is normally a jovial sort of person but apparently I recently ‘got on his goat’ so he wrote an article about how he is worried that I might be selling his farm. I want to reassure the London Welsh minister that he need have no fear of my getting on his goats or selling his farm – I have enough to do with my own sheep on my wee Scottish croft. But he does raise some serious issues. He accuses me and my church, and presumably anyone else who does this, of being ‘covenant breakers’, conceding to the demands of the religious market place; doing things that are not in the Confession; encouraging people to neglect a biblical ordinance and commit serious sin; encouraging an emphasis on what humans have done rather than what God has done; undermining people’s faith in the bible; and starting the church down the slippery road to homosexuality! It’s a heady catalogue of sins, errors and misdemeanors. Why? What is this grievous sin we have committed? What heresy has so got on Mr. Levy’s goat that he feels compelled to issue such a serious public rebuke? We have some parents in St Peters who are not convinced of the biblical case for infant baptism and yet wish to publicly acknowledge that their children are a gift from God. For those who cannot accept infant baptism we offer a service that includes infant dedication – where the parents promise to bring up their children in the fear and love of the Lord, according to the Word of God. For doing this one thing we are denounced as ‘covenant breakers’ etc. Normally one’s first reaction is to respond in kind, but as you get older you realize that this kind of thing is going to happen and you just smile and get on with it. Paul is a good man and I wish nothing but good for the IPC congregation in Ealing – some of whom even deign to read this blog! And that was the way I was going to leave it – to be honest there are a lot more important issues to deal with (Evangelical Times for example also accused me, on another issue, of selling the farm, or in their case I think it was the whole country – but that can wait till another time!) – and this did strike me a wee bit as a kind of modern day Reformed equivalent of angels dancing on a pinhead. So in the words of the Beatles ‘Mother Mary, said to me, let it be’! Or as every Frozen child knows ‘Let it go! But I am neither Catholic nor the Frozen Chosen, and this is the modern era. It’s the age of social media and suddenly I found this article being retweeted and ‘liked’ by people in my own denomination. So now I have to respond because to be honest I’m fed up of having decades of some people in the Free Church gossiping and undermining the work of the Lord here. I think my favourites were the two visiting ladies after a morning service who told me that they loved the service and were surprised I preached the Gospel! Their Free Church minister had told them that we did not do so and discouraged them from attending. So I make it my practice to challenge every complaint from within the denomination and urge people to use proper procedure if they think we are being unbiblical, and not to engage in social media tittle-tattle. I am compelled to defend my congregation and what we do – and also speak up for those who worship with us and yet are not convinced of our case for infant baptism. I am also grateful to Paul because his article has allowed me to reflect on modern day pastoral ministry and the approach we take. So thanks to Mr. Levy here are some thoughts for people in my own denomination and any others who are interested. If you are the kind of person whose favourite spectator sport is theological catfights – this ain’t for you. I would hope that we could be a wee bit more mature than that. Infant blessing – for non-Christians who come and want their child ‘to be done’. They have a superstitious view of baptism but also a genuine desire to seek God’s blessing on their child. If they wish so I just ask them to come up, pray for their child and seek to introduce them to Christ. There are no vows to be taken. Infant Dedication – This is for Christians who want to take vows and promise to bring up their children in the love and fear of the Lord. They do take vows. Infant Baptism – This is the gold standard! It is infant dedication, plus the sign of baptism. The parents take vows, but also the congregation take one because we are welcoming the child as a member of the congregation. One of the ironies is that last Sunday we had a lovely infant baptism – just as two Sundays before we had an infant dedication and next month we have more infant baptisms. The work goes on! So what is so wrong with what Paul has written? It is OTT, intemperate and unwise. I’m not sure that Paul meant it this way but the article is for a biblical Christian, an appalling slander. Being a Covenant breaker is one of the most serious sins you can commit against a holy Covenant keeping God. Psa. 78:10 they did not keep God’s covenant and refused to live by his law. Is. 24:5 The earth is defiled by its people; they have disobeyed the laws, violated the statutes and broken the everlasting covenant. Ezek. 17:19 “ ‘Therefore this is what the Sovereign LORD says: As surely as I live, I will repay him for despising my oath and breaking my covenant. Matt. 26:28 This is my blood of the covenant, which is poured out for many for the forgiveness of sins. To be accused of breaking the covenant – for which Christ shed his blood- is about as serious an accusation in my eyes as one can make. Of course I don’t think Paul meant it. “You need dedication to be a Covenant breaker” is I suspect an attempt to be witty but it fails. Not all of us can be Carl Truman! It fails not just because the allusion is to Roy Castle and his ‘Record Breakers” show, and Roy was a Baptist….but because it ends up accusing faithful Christians of being unfaithful Covenant breakers. There is a place for such accusation (for actual covenant breakers – who deny the Scripture or the blood of the Saviour who bought them) but this is not it. We should not play fast and loose with accusations. It accuses a sister church which does something different to what IPC practice of doing so in some kind of vain attempt to concede to the religious market place. Paul would have a heart attack if he saw our mass, vestments, dance group and hears our Hillsong praise band! I don’t think I have ever in my life thought ‘how can I appeal to the religious market place?”. My mind is just not wired that way. I want to reach out to the lost. The religious I leave to others. Again as a general principle it is never wise to attribute motivation when you don’t know it. (For example I don’t know why Paul wrote his piece, other that my original article got ‘on his goat’, but I see no need to attribute any motive other than he just thought I was wrong and wanted to correct me – which is fair enough). However to be accused of tailoring worship in order to be people pleasers is an unworthy accusation, especially when the motivation is not known. Only the Lord sees into people’s hearts. It misquotes and misrepresents the Confession of Faith. The Confession of Faith does not say that neglecting infant baptism is a serious sin; it does say that neglecting the ordinance of baptism is a serious sin. Which is why we don’t let unbaptized people become members or take communion. If Paul really believed that neglecting infant baptism was a ‘serious sin’ he would not be so sanguine about those in his congregation who commit that serious sin. Would he be as tolerant of other serious sins? Would he say that adulterers are welcome in his church as members but he hopes they would just feel a wee bit uncomfortable? No of course he would exercise church discipline in this case. If Paul believes this is a serious sin then his church members who commit that sin should be disciplined. If he does not think that neglecting infant baptism is a serious sin, he should not have misquoted the WCF in order to attack the practice of a sister church. The other part of this argument is that we are doing something that is not in the confession. Mea Culpa. This is the only one of the accusations that are true. We do do things that are not in the Confession. But so do IPC and every church I know. Where are musical instruments in the Confession? Or hymns? Or church buildings? Or membership classes? There are many things that are not in the Confession. In our public worship in St Peters we have a Confession of sin, a pronouncement of pardon, we use musical instruments and sing hymns as well as psalms, we have a lectern, a baptismal font and other ecclesiastical furnishings. We pray for missions work and have mission’s talks. We have a children’s talk. None of these things are in the Confession. Are we to be condemned for doing them? It never quotes Scripture and makes a claim that is scripturally unwarranted. It is a little ironic that in a polemical piece attacking the practice of another church for being unbiblical, the bible is never cited. And whilst it is true that infant dedications are not commanded, that is an argument that proves too much. You will struggle to find infant baptisms specifically commanded (or indeed women taking communion! ), but they can be worked out by good and necessary consequence. In terms of parents dedicating their children to the Lord I would suggest 1 Samuel ch.1 and Matthew 19:13-14 do the same. Then people brought little children to Jesus for him to place his hands on them and pray for them. But the disciples rebuked them. Jesus said, “Let the little children come to me, and do not hinder them, for the kingdom of heaven belongs to such as these.” Jesus was not baptizing these children, but he was blessing them, because the parents brought them. In what way are we doing anything different when parents want to bring their children to be blessed by Christ? Why should we be rebuked as covenant breakers by the disciples for doing that? It misrepresents the motives of parents who want their children dedicated and those of us who allow that to happen. “If we see Baptism as the covenant sign of entrance to the church, I’m not sure what sign Baby Dedication is a sign of, apart from wanting Baptists to feel welcome in the church.” Again this an unnecessarily sarcastic remark, attributing shallow motives to those involved. What is it a sign of? It’s a sign of parents who realise that they cannot bring up children in their own strength. It’s a sign of parents who recognise that “children are a heritage from the Lord” (Ps 127:3) and want to give thanks for that. It’s a sign of Gods blessing on the covenant community in providing us with children. It’s a sign of believers who want to acknowledge that their children are the Lords. It’s a sign of those who want to promise publicly to bring up their children in the nurture, admonition and love of the Lord. Paul may choose to turn down the young couple who would like to publicly dedicate their child – that’s his perogative and I won’t criticise him for it. I just wish he would return the courtesy. I have no intention of holding people back from doing something that is biblical, just on the grounds that they don’t cross the t’s and dot the i’s on every jot and tittle of doctrine – or that they don’t accept something else that is just as biblical. Infant dedication for those who don’t believe in infant baptism is not necessary for these things – but it is not wrong either. We do many things that are not absolutely necessary and that are not wrong. To simply say you are only doing this as a compromise to make Baptists feel welcome is demeaning both to them and us. It uses the slippery slope argument in an illogical and unhelpful way. But that is not what we are saying. I teach clearly about infant baptism and argue that it is the biblical position. I also recognise that it is a divisive issue amongst biblical Christians and that I am not brilliant or arrogant enough to say that Spurgeon, Lloyd Jones, Mark Dever, Don Carson, Jim Turrent or Paul Rees are covenant breakers. Paul is making a category error here – we are not saying that there is either infant baptism or infant dedication as the sacrament of entering the covenant community. Infant dedication is not a sacrament. We are saying that baptism is the sacrament and that the bible encourages believers and their children to be baptised. Those who do not accept that, we permit to dedicate their children, not as a substitute for baptism (because the children will still have to be baptised to become members at some later point). Our position is that dedicating ones children to God is not wrong, but that baptising them is better. “If you take the approach, “this is one interpretation and feel free to disagree”, then to be consistent on this will mean taking the same approach on Spiritual gifts, complementarian/ egalitarian,” – Yes. We do precisely that. I have a congregation with members in it who are into spiritual gifts and who are egalitarian (things about which it could be argued that the WCF says nothing), and we do welcome people and say to people that they are free to disagree. They are of course not free to become office bearers and be ordained if they go against the Confessional standard that office bearers have to sign up to. But we don’t require members to do so. This is what Presbyterianism is. This is not Independency. Apart from the fact that the WCF doesn’t say anything about women preaching, the problem with this argument is that it again comparing apples with oranges. The Bible for example quite clearly forbids women being elders; it doesn’t forbid parents publicly dedicating their children to the Lord. Realistically in the next 5 years our churches will have people who apply to membership who would claim faith in Christ but have a different view on the bible’s teaching on homosexuality and yet expect to be welcomed in. The role of a full confession of faith which we hold to and teach will be even more vital in the decades to come. This is not realistic. To link dedicating a child to the acceptance of homosexuality is an illogical leap. And to rely on a Confession of Faith to protect us (a Confession by the way which says nothing about homosexuality), is unwise. We rely on the Scriptures. We are bound to teach only the Scriptures and to command obedience only to what is required in the Scriptures. That means as a biblical church we will never give into societies pressures on this or other counter cultural issues. I must admit that as someone who takes bullets every week for standing up for the bibles teaching on these issues, I had a wry smile that my permitting a couple to dedicate their child to the Lord was apparently the first step on the road to Sodom! It strains at gnats whilst swallowing camels. Here I want to return to the question of our adherence to the WCF – which Paul unwisely uses as a club to beat us for allowing parents to dedicate their children. My fear is that there is the danger of straining at a gnat and swallowing a camel. Because whilst the Confession says nothing about infant dedication, it has a great deal to say about church unity. Indeed the whole purpose of the Westminster Assembly was to create a united church for the whole United Kingdom. 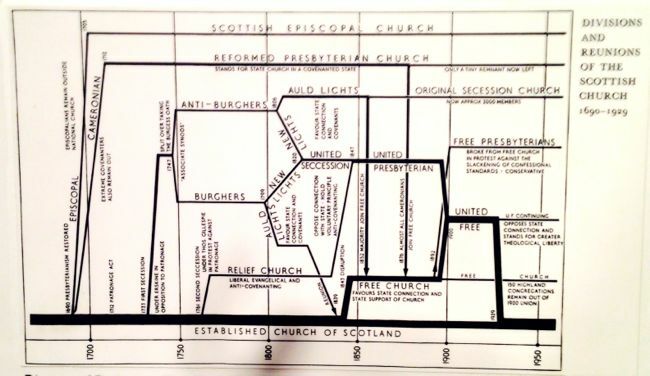 At the risk of overgeneralization it seems to me that there is a Scottish/UK version of Presbyterianism that seeks (but does not often practice) visible church unity and does not accept the ‘market place’ mentality that Paul mentions. On the other hand in the US, the land of 1,000 denominations, there is a much greater market place mentality with the pros (greater initiatives, freedom etc.) and cons (disunity, less church discipline etc.). It seems sad to me that even as the number of Christians in the US declines, the number of Presbyterian denominations will probably increase – all owning allegiance to a Confession of Faith which was set up to prevent that happening! In England there are hardly any Presbyterians and yet we have at least two denominations committed to the WCF. In Scotland the situation is embarrassingly worse. I feel bad that the Free Church has to exist. Because of the apostasy of the Church of Scotland, I think we do have to, but I would much prefer that we didn’t. At one point I was even part of a delegation from the Free Church that met with the C of S and looked at whether and how we could reunite. But it is even more shameful to me that after a lifetime devoted to evangelism in a declining church in a decaying culture, instead of the churches which adhere to the WCF uniting together we have further divided. In my time in ministry in Scotland we have even seen four new Presbyterian denominations, all adhering to the WCF, come into being. The Associated Presbyterians, the Free Church Continuing, International Presbyterian Church and Covenant Fellowship. We talk about church unity but actions speak louder than words. My hope and prayer is that one day the Free Church will cease to exist (that will certainly come true in heaven!). I would be even more radical than that – I would prefer to work in organizational unity with Baptists and others – not just networking but pooling resources and genuinely being the one Church of Jesus Christ. Let me add one further reflection on this – and it’s to do with the religious market place mentality. I don’t believe that most new denominations are set up for theological reasons. I think they are set up for what could be termed ‘market place’ reasons. When evangelicals in the Church of Scotland decided that enough was enough and began to leave – they of course looked for a Confessional Presbyterian Church that was faithful to the Bible. For doctrinal and practical reasons most could not join the Reformed Presbyterians, the APC, the Free Church Continuing or the Free Presbyterians – amongst other reasons they were exclusive psalmody. That basically left the Free Church. Now there may be theological reasons why some ex C of S ministers and congregations could not join the Free Church (e.g. those who had women elders and wanted to retain them), but what of those who subscribe to the WCF, are complementarian and Presbyterian? Many have joined but an equal number haven’t – why? Some of it may be the Free Churches own fault – not being welcoming enough etc., but is that the real or adequate reason? I think that it is the religious market place that Paul so rightly complains about which kicks in here. The reasons are not doctrinal and theological but social, personal and historical. Some had an aversion to the Free Church because of past experience (love remembers no wrongs? ), image or misunderstandings about our positions. I have heard others though express things in terms of what I could only call social and class snobbery. We are perceived as not sophisticated enough, too Highland, too working class. I recall a C of S man having what I can only describe as a ‘coming out’ dinner in his home – where he invited his middle class friends to a dinner at which he introduced myself and a couple of others from the church and then announced he was attending the Free Church. It was as though he had announced he was gay! In fact he probably would have got a more favourable response! That attitude may be extreme but in a more modified form it is still there. Is not wanting to be called ‘Wee Free’ a sufficient reason for setting up yet another denomination? There may be a good reason for this, although I have yet to hear it and even asking the question winds people up; but why does Scotland need yet more Presbyterian denominations (I hear at least one other one is on the way)? All holding to the same Confession of Faith, the same ecclesiology and the same worship? Is that not the very antithesis of Westminster Confessional Presbyterianism? Is the problem not that someone is ‘selling the farm,’ but rather that it is being parcelled off into ever smaller lots, making the actual farming and bringing in the harvest, far more difficult?! Of course we want to see the farm (kingdom) extended and it may be that a plethora of new denominations is the way to do so; but my experience and understanding is that it is when the farm is declining, not expanding, you get this kind of division. Crofts are cute in Brigadoon; they are pretty useless for bringing in a harvest in Glasgow. It reflects a model of ministry that is problematic. I may be going out on a limb here, but I would want to urge our younger ministers to consider what kind of ministry they are going to have. A purist and polemical approach or a parish and pastoral one? Let me explain what I mean. Of course we all want purity and I, of all people, am not going to argue against being polemical! But when you are in a catchment area of hundreds of thousands of people, where there are already many evangelical churches, and when you lay (correctly) great stock on doctrinal purity, there is a temptation to become a gathered church of the like-minded, defining yourselves as much as by what you are not, as by what you are. The ‘competition’ then becomes those who are closest to you, not those who are furthest from you (at least in theological terms). We then are in danger of becoming more concerned about what those closest to us think of us (are we ‘sound’, is our practice/ethos correct?). This in turn results in a ‘truly Reformed’ mentality and a self-consciousness about our identity in the eyes of the church. It also results in the ‘tyranny of networks’! Let me give one example of how this can work in a local situation. When a number of years ago we decided in St Peters to take the then ‘radical’ step of singing different versions of the psalms, rather than just the 1650 version) one of my elders, who was relatively new to the Free Church and from an English background actually asked “what would Stornoway think of this?”. Before I could open my mouth, another elder who was actually from Stornoway said, “who cares? We are in Dundee, not Stornoway! The question is what does the Bible say and what would be good for our people and outreach here”. That is the question we should always be asking. Its difficult enough to do outreach and evangelism without looking over your shoulder at others who accuse you of ‘selling the farm’ or breaking the covenant! Another example is one that I heard from our Assembly many moons ago – where an elder boasted that the Free Church in Toronto was the only exclusive psalm singing congregation in the metropolis and had grown to over 50 – out of five million! It was such a depressing narrowing and even negation of Gospel vision. The parish and pastoral approach is one that I prefer. We are not engaging in the religious market place (ironically those who take the purist/polemical approach are much more likely to do that), but we are seeking to reach out to every one in the community where we are based. (I realize of course that most of us would claim that is what we are doing and I should also point out that I think that is what Paul’s church is doing in Ealing – I’m talking about the wider issue here – not having a subtle dig – I don’t do subtle!). This means that our primary identity is not that we are a Free Church, or a Reformed church, or the church with the best preaching in Dundee, or David Robertson’s church or any other claim we might foolishly want to make. We are a church of Jesus Christ. Two students who attended St Peters were standing at a bus stop. They vaguely recognized each other. One said ‘Have I seen you at CU or at church?” – “Yes- I think so – what church do you go to? The Free Church?” “Oh no….I go to St Petes”. We are not ashamed of being Free Church but we don’t need to wear it on our sleeves. It’s a cliché but our identity is in Christ, not in Chalmers. In the Free Church I hope we are confident enough in our Reformed faith that we don’t need to wear it as a T-shirt. The Reformed Faith is our skeleton, but if you see the skeleton there is usually something wrong with the body! We don’t have to carve a niche for ourselves in the small world that is Reformed Christianity in the UK. We aim for a more parish based pastoral ministry – a church for saints and sinners – not the super-filter for the uber elect. That means we accept mess – we accept disagreement – it means we are firm on the fundamentals and flexible on the adiaphora. And we refused to be bullied by the fear of those of appearing unsound to those looking in from a distance. How does this work in practice? Take the subject under discussion. A couple start attending your church. They become members. They get married. They have a child. You speak to them about Baptism because that is what you think they should do. But they think that infant baptism is wrong. You cannot force them to have their child baptised, not least because whatsoever is not of faith is sin. You may regard them as the weaker brother/sister because of their lack of acceptance/understanding of covenant theology. But they then say that they would like to invite friends and family and dedicate their child to the Lord. A pure/polemical approach says ‘no, we don’t do that. If you really want that you need to go elsewhere’. They may do so and you may feel that you have preserved your purity. For me a pastoral approach is to say, ‘brother, sister… I think infant baptism is better but because you are not persuaded of course we are happy to have you dedicate your child to Christ and to seek his blessing upon your child”. Calvin talks about God ‘accommodating’ us because of our weaknesses. Why can’t we do the same to one another? I’m not talking about where this is clear and plain disobedience to Scripture – but what about where there is a difference of understanding about secondary matters? This may be a pragmatic argument but it is biblical and I think it works well. Yes I have seen those who are absolutely convinced of the Baptistic position get up and walk out of a service never to return when we baptise a child. So be it. And I think in 25 years I can recall one man who thought that we ‘accommodated’ too much and so felt that God was leading him to another church. Ironically he ended up in a liberal Presbyterian church! On the other hand I currently have four elders, who as far as I know when they came into membership in St Peters were adult Baptist only and who over the years have gradually changed and now accept the paedo-Baptist position. In my view if we had been ‘purist’ on this, such a result would have been unlikely. And Finally…Who Cares for the Free Church? Just a minor epistle then? I think it is probably bigger than some of the minor prophets!!! As Ray Kelly observes, not too short an article, but worthwhile. I spent 12 years in the Middle East – Friday morning’s bible study saw 13 different denominations (not bad for 13 people) meeting as one in Christ. The immediate environment focused the mind and advised against separation over non essentials, however important. In almost 60 years of sentient church attendance in a variety of countries and denominations I have learned that Life is more important than form. I attend an Independent Church and am Baptist by persuasion, but see baptism as a secondary issue that should not separate brethren. I loved it when I read in your earlier blog that out of Christian love you had dedicated the child of parents who were not convinced of infant baptism. I thought in this you’d provided a great example to both the world and the Church of how Christians should behave. I hope Independent Churches could follow your example. So I was shocked and frankly depressed to read the accusations made against you – not by secular journalists – you have to cope with enough of them – but by a brother! But thank you for taking the time to write this response. I found it a helpful model of pastoral wisdom. You are a great example of committed Christian leadership. Thank you. Church history is woefully deprived of many cases like this because chroniclers ignore disputes and misunderstandings when they can, and cover them up with platitudes when they can’t. Telling us that some rift was ‘all smoothed over’ might be good hagiography but it hardly prepares us for the next time if we don’t know what was smoothed over or how. By Murphy’s Law, communication in a fallen world will occasionally become miscommunication and we have a responsibility, not only to patch things up but to do so openly. So, thank you both, David and Paul. Very well put John. Amen. As one of Pl’s elders I will put some context round his article that his position may be better understood. There is no anti-smoker like an former smoker. Paul comes from a very Baptist background. Prior to his pastorate our congregation did allow dedications. We have now changed. In England where credo-baptism is the default position I think it reasonable to take a stand against dedication which at best is dry baptism if a covenant view of children is accepted. We have not lost members over this. We have gained some people coming to understand covenant baptism and its subjects. Paul’s humour in this did not work. You are no covenant breaker. But as you move on to Presbyterian denominationalism in England and Scotland I shall add my two pennorth. I regret that EPCEW was formed without consultation with IPC and would love to see the two become one. There are few fundamental differences. One is the academic requirements to be a teaching elder. As to IPC in Scotland, it is not of IPC in England’s making. Originally three pastors in the C o S came to us considering leaving. All three eventually left with their churches. Only one of them is now in IPC. The other two are independent seemingly having thrown out the Presbyterian baby when leaving the CoS murky bathwater. I think that since the FCS lost the strict exclusive psalmody the natural home for those leaving the CoS could be FCS but IPC remains an open door. Thanks for this – although you don’t sound very grumpy! Dedication is not ‘at best’ dry baptism. At best it is a parents dedicating their child to the Lord. Perhaps we need to be more generous in our opinions of others motivations? I would also like to point out that the motivation for not allowing infant dedication appears to be quite a fearful one, stemming perhaps from a lack of confidence? Why should we be concerned about what others might think? It is precisely because I am confident in the view and infant baptism that we hold, but I’m not afraid of others opinions and am quite happy to allow people to dedicate their child to the Lord, whilst at the same time hoping that they would see fit to give their child the covenant sign. I don’t regard the two as alternatives or opposites. I took the pseudonym when I was a GOC. Now I am happily retired from the NHS as a provider, I am merely a regular consumer. Levy and I are not fearful of what others may think. We merely want to be happy sprinklers and encourage more covenant baptisms. Do you BTW question the parents as to their theology of children before dedication? But surely you realise that pouring and dipping is also covenant baptism? And it seems to me that you are concerned that people will think it is a substitute for baptism? I always speak with the parents about their theology before dedication or baptism! Of course we in IPC accept any of the three modes of baptism. Yes, dedication is a substitute for infant baptism. It may be that we differ over this because credo-baptism is the default position among non-anglican evangelicals in England and that may not be the case in Scotland thanks to its Presbyterian heritage. Wondering. No – dedication is not necessarily a substitute for infant baptism. How do I know that? Because if someone came to me who had had their child dedicated and wanted them baptised, we would baptise them. Baptism is a sacrament, dedication is not. Your fear is that it will be perceived as such. I don’t share that fear – I think with proper biblical teaching the two are not seen as equivalent. This is the kind of post that makes me glad that I live far away from the diseased world that passes for Reformed Christianity in some sections of the American church. Nasty, smug, superior, dumb and dishonest. I would reply to each of your points but then I thought why bother. You just made up things that I didn’t say (for example that I prefer to minister with Baptists than Presbyterians) and in a failed attempt to be witty you have uttered a number of complete fallacies. I think I should just leave you to talk to yourself and wallow in your own smugness. Its embarrassing though that this kind of nonsense gets associated with Christianity – in any form. As your own President would say…very sad! David did I miss something,or did you just roll out the big guns & blast the living daylights out of ‘David July 29, 2017 at 11:13 am’? Did I miss a thread? Or are you having an off day? Yes – Ray – you did miss something. I was referring to the pingback article linked to not to David…. Thanks David, I thought I Had missed a thread somewhere 😁. I’ll read the article. So do you advocate dedication for baptised infants? No – because baptism has already incorporated everything that dedication involves – and much more. I’ve heard it repeatedly from Reformed paedobaptists — Presbyterian, Congregtionalist, and Anglican — over the years that they just don’t understnd why Baptists don’t use water in their baby dedications and be done with it. It must seem like a good, friendly poke in the right direction but there does seem to be an expectation that no answer will be forthcoming. No one should presume to speak for all Baptists on the issue, of course, but the more a Baptist understands and appreciates what it is that Reformed paedobaptists are doing the less inclined they will be to ‘use water’ in any sort of household initiation or infant dedication. The reason for the reticence and the answer to the ‘why not?’ question is that we know that if there is any suggestion that a dedication is turned into a baptism then .somewhere down the line, when the subject of the dedication wants to be baptised you will call us anabaptists. Seems to be so much confusion and misunderstanding. Baptist, credo baptism, policy is straightforward as shown by David (29 July). I’m pleased to say I knew nothing about Presbyterianism before I had been baptised by full immersion as an adult believer. Almost everything I know about the Presbyterian church comes from this blog and links, and little seems to be edifying, with splits and splinters and a party spirit. The “pingback”, above is an example. To my mind, it ultimately dishonours Christ, not that other denominations are exempt. I’m not Catholic, but all of this appears to stem from the Reformation, from pro-test-ants as the source. Protest. Neither am I a church historian. certainly not me, in any way, shape, or form could I do it, merit much, much more than His favour. I don’t actually think that Baptist policy is straightforward. What do you do if someone wants to be re-baptised as an adult, on the grounds that their first adult baptism was when they were not really converted? No – of course we wouldn’t. Because in our way of looking at things – baptism is something that God does for us. For the credoBaptist its something that we do for God. I’m not a Baptist, neither am I a minister, so perhaps someone will be along to answer that point, David. But so as not to cop out, I ‘d start with questioning. What were the beliefs then and now? How do they differ? Why did they get baptised.? What were their motives then and now? What is their understanding of what baptism is, achieves or signifies? So, firstly, I’d be wary. It seems a less likely scenario, than an adult coming to faith, who seeks baptism, who was baptised as a child, perhaps never brought up in church. The child dedications I’ve witnessed have not involved water at all. I think it was Andrew Wison who said that paedobaptist have a better theology of children, but credobaptists have a better theology of baptism. While I no longer worship in an Anglican church, I came to faith there and was confirmed as an adult, so, although I never really considered myself as Anglican the church may still see me as theirs. What I do find difficult to accept, locally, churches of the reformed persuasion have tended hold themselves separate or aloof from the rest. At the Keswick Convention, with this years teaching on reformed theology, through the scriptures, we all worship together and no one knows what the other believes, in the mix together, with Christ the object of our faith and worship, not ourselves. It’s the busiest I’ve seen it for some years, with overflow venues being full. I’m not sure whether heretic hunters are excluded. Armed police were standing guard. I’ll take up the invitation to listen to Sinclair Ferguson. Thats a neat quote by Andrew Wilson – but wrong! The key difference is that credo-Baptists believe that baptism is something we do for God, paedo-Baptists tend to believe that it is something that God does for us – and therefore there is less emphasis on the human agency and motivation – though not entirely excluded. Sorry, but no it isn’t. We believe baptism to be a sacrament administered in the name of the Triune God. I’ve never before heard the idea it is something we are doing ‘for God’ any more than the Lord’s Supper is something we are doing ‘for God.’ But we are now straying a long way from your very gracious and beautifully Christian practice of dedicating the infants of believers who are not paedo baptists. I appreciate that – but do you really deny that most people who get baptised as adults do so primarily because they are professing their faith, they are witnessing to their conversion. The only people I have met are those few people who believe that the act of adult baptism conveys grace and salvation and without it you cannot be saved – in much the same way as the RC’s believe infant baptism does. I don’t know anyone who regards the Lord’s Supper in that way. I’ve never met anyone who being baptised believes adult baptism conveys grace and salvation. I don’t understand how you can say in baptising infants God is doing something. Aren’t you saying precisely that? do all baptised infants grow up and be converted? No. Yes I already said that it was unusual – but it does exist for example in the Church of Christ. I’m getting a little confused about your second point. Did you not say that baptism was something that God does for us, rather than we do for God? If that is the case, as we believe, then what he is doing with infants is putting his covenant sign upon them. Just as in the old Testament, the covenant sign of circumcision did not guarantee salvation, so in the new the covenant sign of baptism does not guarantee salvation. They are signs pointing to the grace that is in Christ. When I got baptised it never crossed my mind that I was doing anything for God. Neither was I taught that, nor even hinted at. Whether that is full credo baptist theology I don’t know, but I’d be interested in the source or references, even though it is of no practical significance in my life and I’m not seeking to persuade. Baptists baptise on profession of an individual’s faith, but surely paedo baptists baptise on profession of the parents’ faith. We do not believe baptism imparts grace, or that it is essential to salvation. Surely you are more likely to be accused of that, because you have insisted that in baptism God does something. We are now at the usual stand off between baptist and paedo baptist, each bound by our own conscience. A large part of me wishes I was Presbyterian and paedo baptist. I’d love the security of a denomination behind me and the rich heritage of reformed Protestantism….. Thanks David. I’m not so sure that it is a stand-off. I thought you had agreed that baptism was something which God does, rather than us? I guess the question relies much more on the balance between what God does and what we do. But as I said in the article – I don’t expect Christians to agree on this until we get to heaven. And then it won’t matter! Thanks for this – it is balanced and helpful. I would agree with you about the freedom of conscience and trust and hope that we will be allowed that. We don’t practice infant dedication as Baptists do. And we – and I suspect you – have lots of things in worship that are not specifically laid down in the WCF but there is scriptural warrant for – we for example have a confession of sin and assurance of pardon, a childrens talk, a collection during the service, we say the Lord’s prayer and the Apostles creed – we have a table for communion and many other things. I have still to find any reason as to why parents thanking God for their children and dedicating them to him is wrong and to be forbidden (other than the ‘we are not Baptists’ routine). My reasons for permitting this are pastoral, not as Donald wrongly alleges ‘proselytising’ and nothing of what we do goes against the Confession. I agree that those who refuse to have their children baptised are going against the Confession – which is why they cannot be ordained as elders. But as members in St Peters who wish to bring their children to Jesus – I am not going to hinder them. Others may have a different view and thats fine – I would however appreciate not being attacked and lambasted (as Donald does) as though I were some kind of heretic undermining Reformed worship and leading the church down the road to destruction. I find it somewhat depressing that this issue seems to have pushed so many peoples buttons – if only they would put such passion into more important matters! I have now encountered a Reformed Baptist who does not dedicate on the grounds that the regulative principle rules it out. You can call it a “Thanksgiving”. That may sound like playing with semantics, but I think it sends a different message. Someone isn’t (yet) convinced of baptising their child, there’s no harm in publicly thanking God and praying for the family. The “dry clean baptism” remark about dedication I think was originally from Alec Motyer & I heard it 1st from David Jackman… a Baptist! Who wouldn’t do dedications – it’s whatever the opposite to having your cake & eating it is. 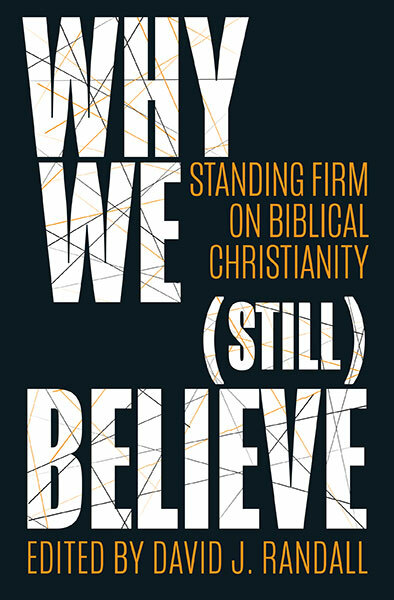 Next Next post: Believe in the Bible or Believe in Yourself – answering heretics in the secular press!